...at least for now. We are putting all our energy and resources into our revolutionary Jellybox. 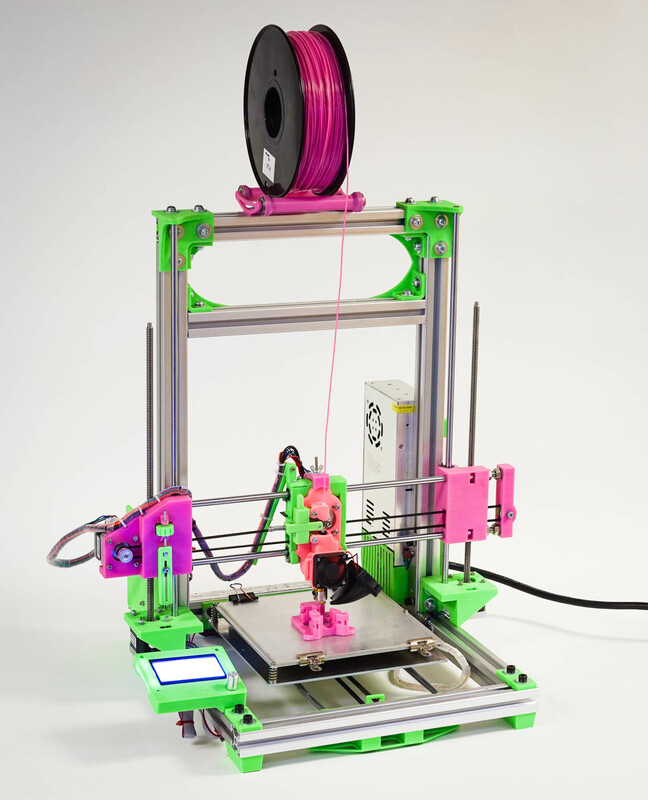 We plan to pick up Pink Frog later as even more modular, bigger, and better, but for now we are not producing any. 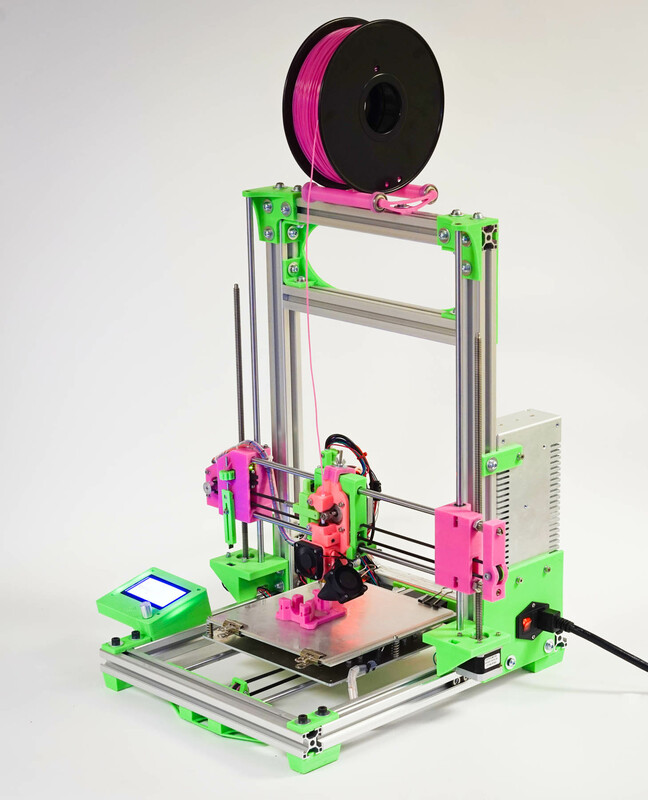 Pink Frog is designed specifically for education and R&D. It’s Modular, Flexible, and Ultimately Tinkerable. 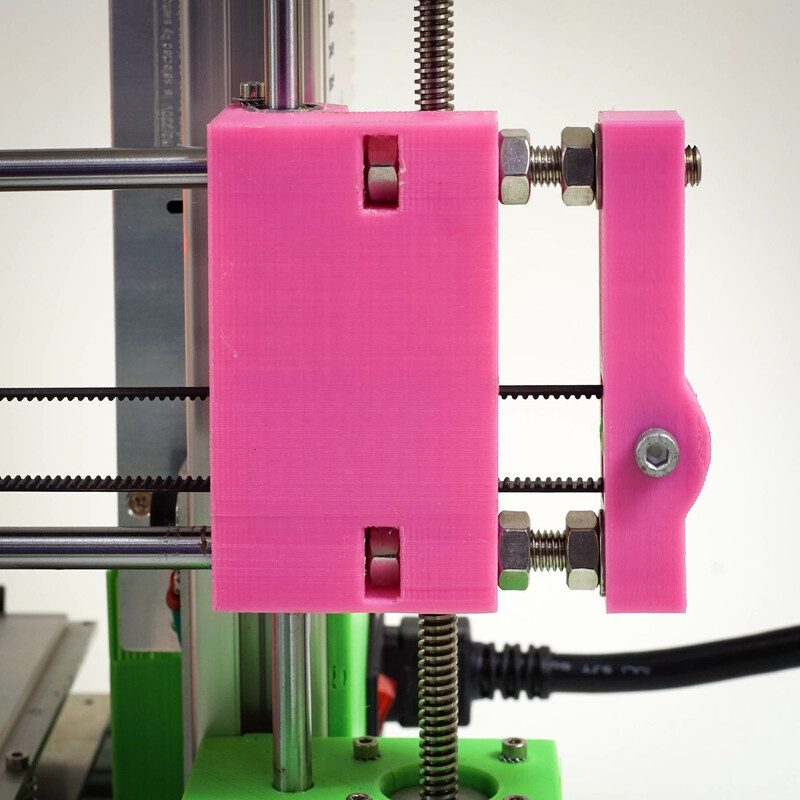 The frame is from standard high quality t-slot aluminum extrusions which makes it a breeze to change the print size in any direction, attach new elements, or integrate the printer into larger t-slot ecosystems and contraptions. 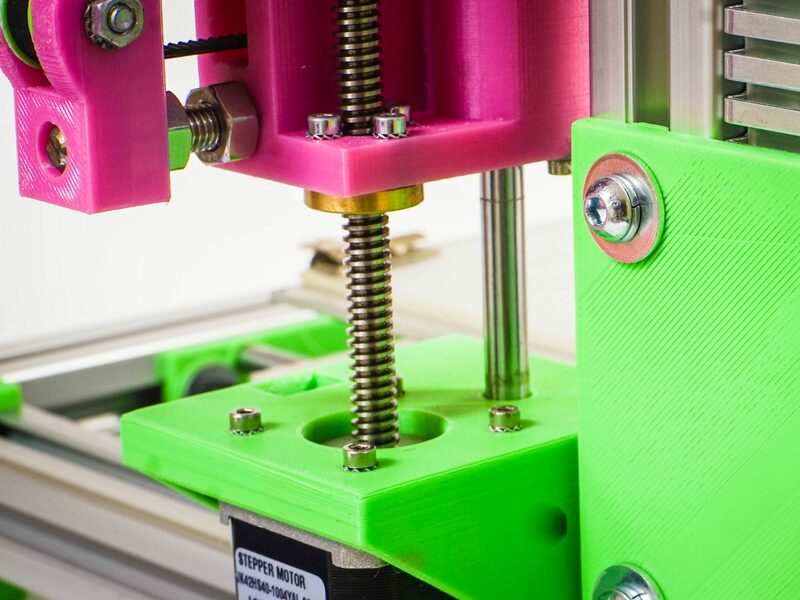 In addition, all connectors and custom parts of the printer are 3D-printable so you can adjust them to your specific needs or completely redesign to make something new and awesome. Both the hotend and the extruder are Quick-Release swappable. Use as many hotends and extruders in your day to day printing as you wish. Plus, why should a clogged nozzle or jammed hotend rob you of precious printing time? Thus, you can easily use various lengths of z axis threaded rods, expand the print area in any direction (you may need a new print bed though), swap extruders, swap hotends, convert from 1.75mm to 3mm filament, use various diameter hobbed gears, and more. Did I mention you get all the source design files. Need to fit a new extruder? Want to change the geometry? Don’t like the way we’ve designed something? Have an idea to make the printer better? No problem. We release the actual source files* we use ourselves so you can easily change anything you want. Don’t get drunk on the power. * only after the printer is in production and out of beta. Sorry, but we can’t don’t feel comfortable giving you an unfinished product. Oh and as for the 3D parts design philosophy, we subscribe to ‘design-for-no-assembly’ and marriage of function and form (but function comes first). But that’s for another story, another time. It’s a power-user’s tinkerer’s dream. Quick release hotends. We went the extra mile to make sure you can swap your jammed hotend with absolute ease. All the wires connecting the hotend to the control electronics are routed through connectors. It takes literary thirty seconds or less to do the whole switcheroo. Quick release extruder assembly. 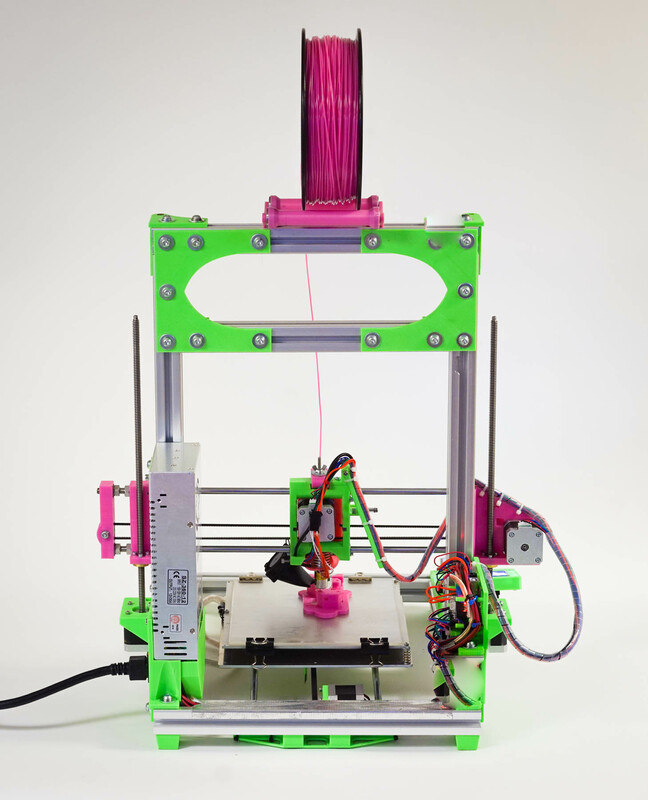 Swap not just the hotend, but the whole extruder in matter of seconds. We’re pretty proud of this one. This allows you to use the best extruder for the job (3mm vs 1.75mm, all metal vs. composite hotend, different melt zone configurations…) on a whim. 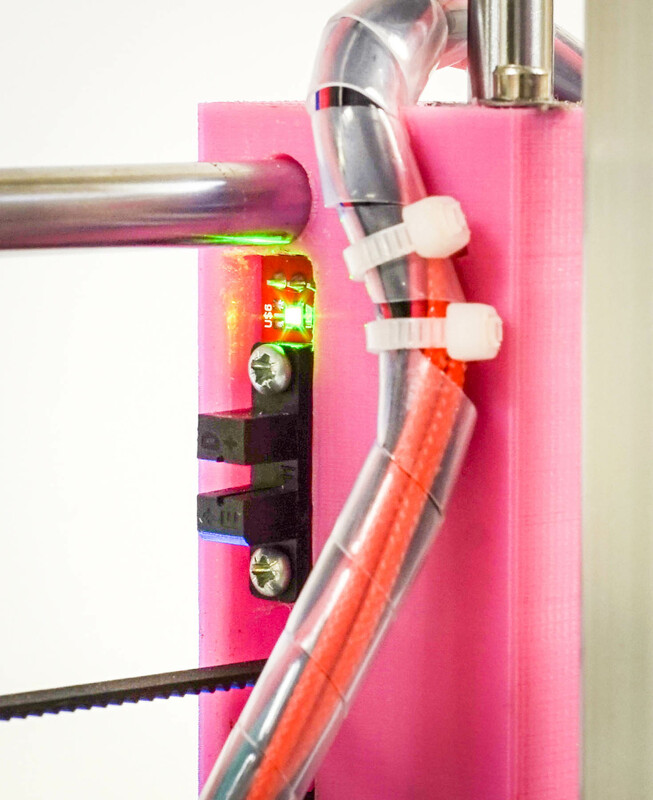 The quick release system also makes it incredibly easy to adapt the printer to fit your own/ your favorite extruder. Just stick it to a blank quick release platform and you’re in business! X-axis ‘pendulum’ cable management. No-one likes loose wires that get in the way or worse run into components. But cable chains can become exquisitely noisy – specially on the x-axis with its rapid back and forth movement. We designed a simplified parallelogram that controls the cable movement without adding noise or complexity. X-axis belt tensioning completely decoupled from z-axis geometry. This means z-axis smooth rods remain perfectly parallel throughout the whole height of the printer. It makes a measurable (and feel-able) positive difference with 200mm print height, but it become a true necessity if you were to upgrade your print height to 300mm or higher. Precision z-axis adjustment. The printer is also ready for hall sensor auto bed tramming, but manual is the most fail-proof backup there is. It’s also really useful if you switch hotend for one with a different z-heigh. Precision drive gear pressure adjustment. Not only you can precisely adjusts the pressure on the hobbed gear (more common and indispensable for flexible filaments! ), but you can also dial in the center position of the drive gear depending on the diameter and hardness of your filament. (less common and great for master tuning). Two-in-one. Integrated filament cooling fans. For PLA, it’s a must. For PET, it’s a really good things to have. We’ve got two 30mm fans for even and silent cooling. Machined steel ACME z-axis threaded rods (also called trapezoid rods). For ultimate precision and banishment of z-wobble. We have achieved print resolution if 0.050mm. Our rods are custom made for us with a lower than common pitch (1x vs 4x) so that there’s no chance of crawl. Optical end stops on ALL axes. The ninjas of end stops. Silent, contact-less, and always dead on precise. So much better than physical switches. Attention to tiny hardware. Lock washer under all plastic holding bolts, serrated washer for metal holding bolts, specialty ‘hammer nuts’ for ultimate holding power in the aluminum t-slots: no expense spared. It’s all in the details. Attention to wiring. Clean practical wiring makes the difference between a prototype and a product. We also thought hard about the wire interactions. By running wires on various sides of the extrusions, we shield more sensitive electronics like LCD from disruptive pulses of the power source. Smooth smooth rods. They’re chromed and hardened. 30mm aluminum t-slot frame. The 30mm extrusions are way sturdier than 20mm ones commonly used in hobby 3D printing. T-slot frame also means the printer is easy to service and extend. Pimped Arduino Electronics (RAMPS.) The closest to vanilla arduino you can get. Great for extending capabilities of your printer. The most time-tested design, plus: we fixed the things that can cause problems (we replace the old fashined fuses and the clunky power supply connector that sometimes burns out on people with our own parts). 12V+ Power Supply. Because our power supplies are built like tanks, we can run them at 13-14 V. This makes heating of the bed much faster without having to opt into the 24V ecosystem. LCD and SD card reader. It’s wonderful both by itself and in conjecture with a computer or OctoPrint. LCD and SD card just tends to be the most fail-proof setup out there.